A load of eight BLM Alaska Fire Service smokejumpers and three aircraft including two water-scooping Fire Boss airplanes responded Friday night to a wildfire on the south side of Point Romanof about 29 miles south of Stebbins. While looking into a report of a possible fire just four miles west of last week’s Kogok 3 Fire (#192), BLM AFS Galena Zone personnel aboard a plane confirmed the report at 3:12 p.m. Friday afternoon. By then, people reported seeing the smoke from Stebbins. 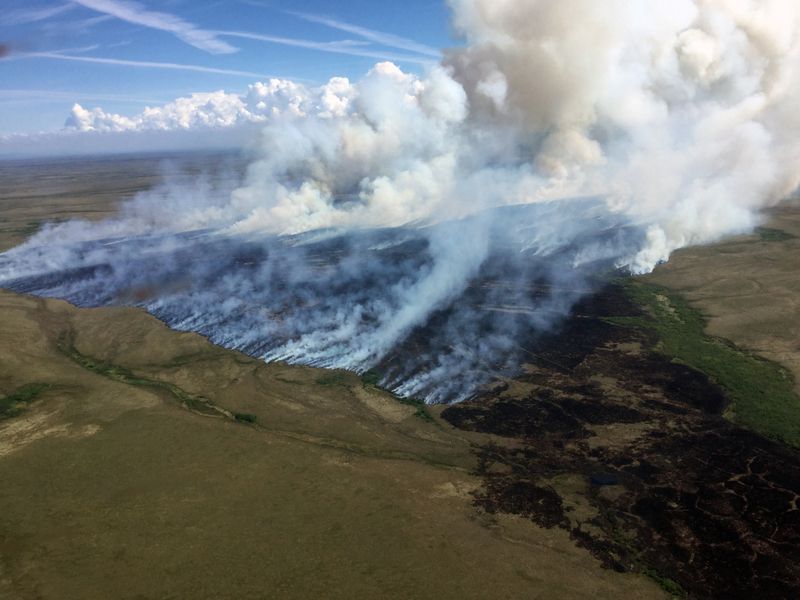 The Romanoff Fire (#234) is burning in a full suppression area on a Native allotment within the Yukon Delta National Wildlife Refuge. When smokejumpers, who were responding from Fairbanks more than 450 miles away, got over the fire shortly before 7 p.m., the fire was estimated to be 800-1,000 acres and 80 percent active with some running and spotting at the fire’s head. The fire originated on the beach of the allotment and is suspected to be human caused. Fire management officials believe humidity levels will significantly increase overnight due to it burning on the Norton Sound coast, helping smokejumpers with fire suppression efforts. There are no structures in the area, but there are Native allotments nearby.